TULTEPEC, Mexico (CNS) — Teams pushed papier-mache bulls laden with fireworks through the streets of this suburb on the northern outskirts of Mexico City, where much of the population makes pyrotechnics — and the market selling them exploded in a December tragedy that cost 42 lives. 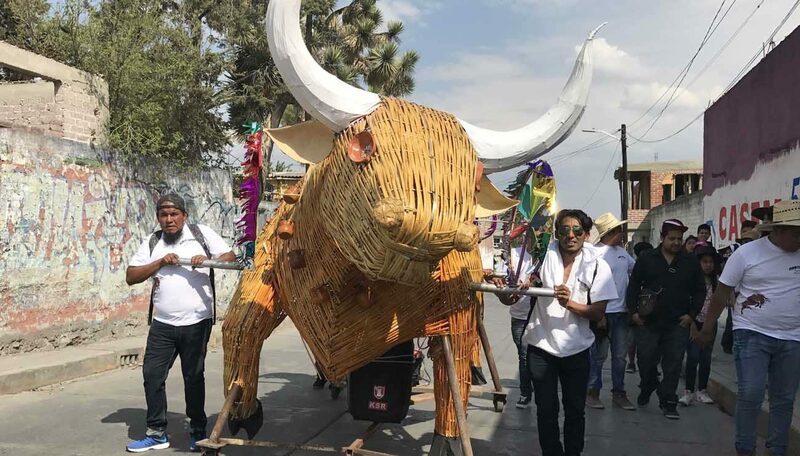 Tultepec residents fashioned the bulls to celebrate the March 8 feast of St. John of God, the patron saint of fireworks makers. They also wanted to show off their talents for working with fire: the bulls were ignited after days, lighting up a night sky with fireworks. “We have to venerate St. John of God and pay homage to those that died,” said Jose Guadalupe Gama, 23, who started in the family fireworks trade at age 8. An estimated 30,000 people in Tultepec work full time in the fireworks trade, and local residents say they’re undeterred by the explosion in the local pyrotechnics market, even though it was the third such mishap at the retail site in 12 years. But the tragedy and subsequent plan to pay homage to the dead with a display of fireworks in the recently concluded national fireworks fair caused uncomfortable questions for some in Mexican society and the Catholic Church about the excessive and often careless use of fireworks during feast days and other celebrations, such as Christmas. Priests could offer few cogent explanations for the excessive use of fireworks other than a fondness for fireworks in all corners of the country. The use of sky rockets — which explode with an obnoxious “Bang!” but don’t light up the night sky — causes complaints in major Mexican cities. Social media users often complain of exploding sky rockets spooking pets, while the noise from fireworks — often exploded shortly after midnight on feast days — makes it hard to sleep. That’s especially the case for saints with strong devotions, such as Our Lady of Guadalupe, the national patroness, and St. Jude Thaddeus, whose devotees make monthly trips to a parish in central Mexico City. Feast days often are organized by a committee outside of parishes, and priests’ proposals that the funds for fireworks be spent instead on social projects are often met with disapproval. Accidents often give pause. 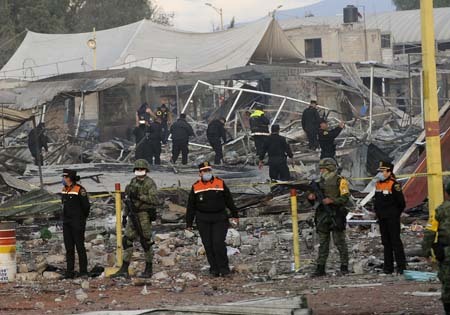 In 2013, a sky rocket hit overhead wires and ricocheted into an accumulation of fireworks, setting off an explosion that killed 16 people and injured more than 100 in the state of Tlaxcala. Some priests speak of precautions — Father Valdemar said fireworks are not stored in church buildings — but most admonishments go unheeded. Father Arriaga recalled performing a baptism at which attendees brought a wooden crate full of pyrotechnics into a church full of lit candles and proceeded to “refill” tubes for shooting off fireworks with gunpowder during the service. He recognizes, though, that in the indigenous community he serves, fireworks have come to form a part of local ceremonies, and there’s a belief for some that prayers are “amplified” by exploding pyrotechnics. In Tultepec, locals venerate St. John of God and like to tell the story of how he braved fire to save patients in his burning hospital. “This is an offering we make as pyrotechnics workers, so that he covers and protects us,” said Cesar Gomez, a local fireworks maker, who commented that Tultepec has a history of bouncing back from the “eight serious accidents” it has suffered. Many of the pyrotechnics in Mexico come from the town of Tultepec, where families have worked in the fireworks for generations. Accidents are a recurring issue. Explosions — including one in early March that killed four people — still occur in private homes, where clandestine manufacturing still takes place and gunpowder is stored. Tultepec residents acknowledged suffering a stigma for so many fireworks mishaps, but seemed sanguine about it and unwilling to abandon their local traditions.